The following page will be loaded. Here you can create new individual or summary reports and edit, publish or delete the already existing ones (if any). Let’s first start with the difference between the individual and summary reports. The individual report is used to present the uptime data for a single target, as opposed to the summary report, which is used when there is a need to include multiple targets. A custom stylesheet can also be uploaded. You can download the default CSS file from here, customize it, upload it on your server and paste the link in the field. The next step involves choosing a password and a report label. The password field could be left blank. A friendly name for the report can be chosen to make to the report easier to access. 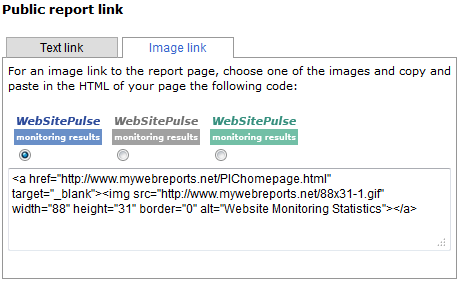 The report will be then available on the following page: www.mywebreports.net/[friendlyname].html. If you leave the field blank the URL will be automatically generated. The report could also be tracked with Google Analytics. 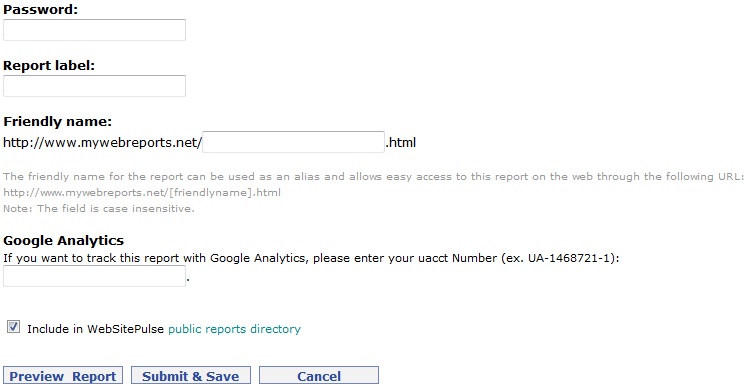 The UACCT number has to be entered in the respective field for this feature to work. You can also choose whether to include your report in our public reports directory or not. 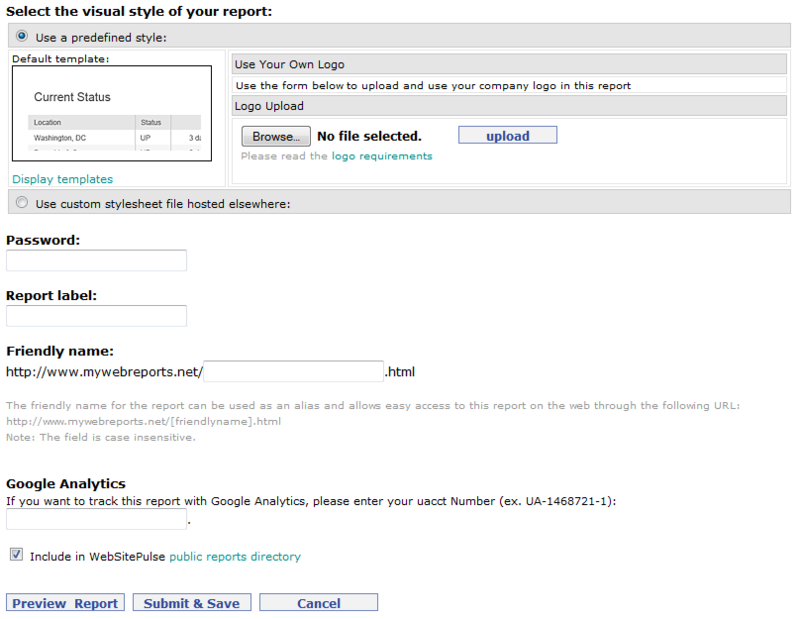 Once you are done configuring the options click the preview report button to see how the report looks like. 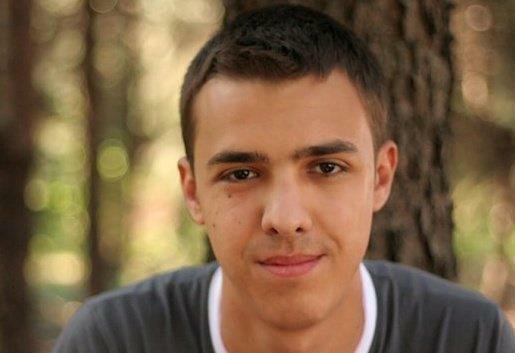 Submit & Save saves the configuration and publishes the report. The Summary Report is almost as easy to configure. The only difference is that multiple targets can be chosen to be shown and that they can be ordered in a different way. Once the report has been created you can publish, edit or delete it on the main page. 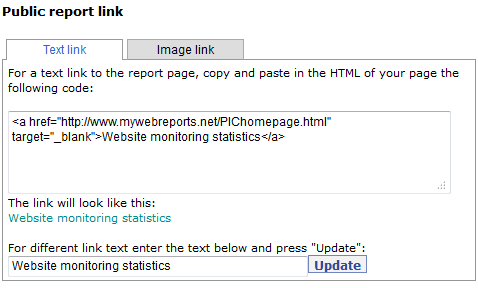 Clicking the Publish link will allow you to get a generated HTML code with a link to the report. 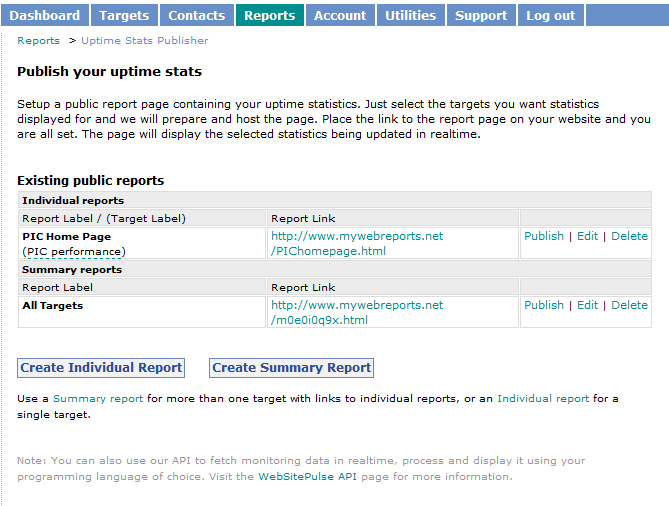 The stats publisher is a useful tool for those that want to keep their customers informed about the uptime of their website without giving them permissions to their WebSitePulse accounts.